Marketers have a tremendous opportunity to use digital channels to push consumers to brick-and-mortar locations. Thinking across channels on- and offline can insure consumers have a unified experience whenever they come into contact with your brand. 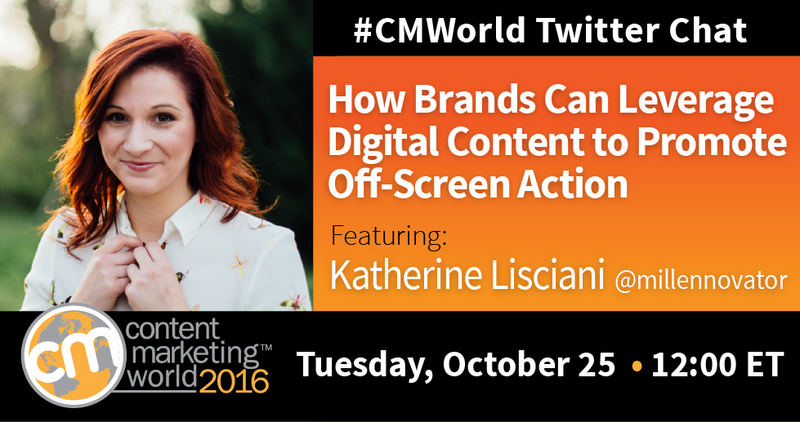 This week, Katherine Lisciani, Founder of MillennovationMedia, joined the #CMWorld Twitter chat to share her insights on having an omni-channel presence. Want your efforts to work together to attract more people into your stores? Looking to use your online channels to increase foot traffic? Read this post to find out more. A few takeaways from the chat are below. Check out our Storify to see more tweets on this topic. Your social channels are the perfect place to show your customers what they can expect if they visit your brick-and-mortar location. When consumers come into a store, reward them with a great experience – in terms of incentives and service. What are examples of brands you’ve seen using content marketing in conjunction with in-person experiences? Please let us know in the comments below. Want to meet some members of our #CMWorld chat community? Follow our Twitter list!